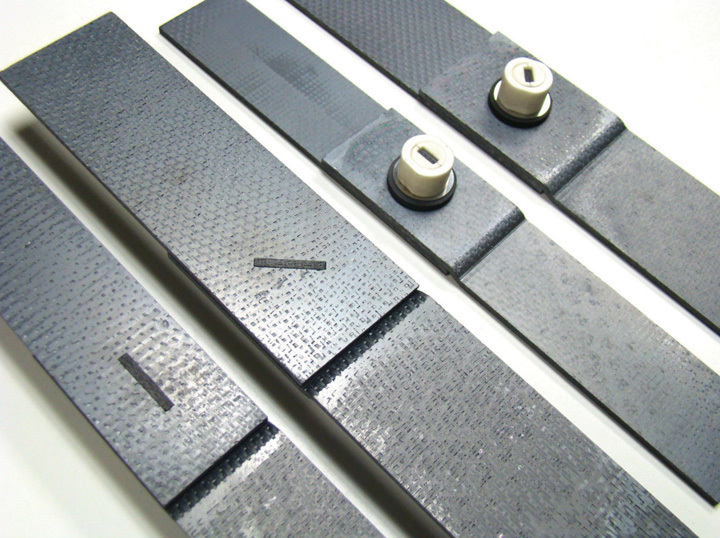 Composite lap joint test articles (Credits: Hyper-Therm High Temperature Composites). Hyper-Therm High Temperature Composites has developed a mechanical fastener system for use in hypersonic propulsion. The new design is able to withstand temperatures impossible for metallic fasteners. The project was intended to develop a lower cost fastener than those traditionally used for high temperature applications. High costs of these traditional technologies derive from use of expensive three dimentional composite materials that must be custom machined, with very low production quantities. The Hyper-Therm alternative reduces these costs by circumventing the machining step altogether. “What makes our two-dimensional, ceramic, mechanical fastener so unique is it is fabricated out of flat, laminated, plate-stock material,” said Steiffier. “It does not look like a traditional bolt that you buy in a hardware store. We are able to greatly reduce the cost of a typical fastener because we are using flat, plate, laminated material and we don’t need to machine threads into the ceramic composite element of this fastener,” he continued. The work was sponsored by NASA’s Small Business Innovative Research (SBIR) program. NASA is interested in high-temperature fasteners for joining sections of thermal protection systems, hypersonic engines and flight control surfaces. The work has led to interest from several aerospace companies, with programs in hypersonic technology.